When Musa Dampha walked the streets of Bansang, Gambia, he couldn’t stop looking over his shoulder. The poorly lit roads did little to curb his anxiety. Tales of unfamiliar silhouettes and sounds of calculated steps culminating in a ceaseless list of missing persons haunted people's minds. Dampha feared at any moment he could be arrested by the government’s National Intelligence Agency notorious for enforcing disappearances. “Where you’ll be taken, no one knows,” Dampha, a graduate student studying African studies, said, remembering his time in Gambia. The freshly elected president of Ohio University’s African Student Union arrived in the U.S. on New Year’s Eve. He stayed at his cousin’s place in Columbus, and as fireworks exploded in the sky, for the first time, he slept a good night's sleep. Dampha is one of the six Gambian students who immigrated to the U.S. to pursue their graduate studies at OU. The idea of a “democratic education” compelled Dampha and fellow Gambian students to travel 5,135 miles from his homeland to Athens. Dampha walks around the grocery store looking for his favorite American snack –– cereal. Under former President Yahya Jammeh, sleep didn’t come easy for most Gambians, Dampha said. Jammeh came to power through a coup in 1994 and became infamous for atrocities that included gross human rights violations, such as threats to decapitate LGBT people and arrests of opposition party members and journalists who critiqued him. At first, Dampha said, Gambians thought Jammeh had a vision, evidenced by the surprisingly peaceful transition. Since seizing power, Jammeh ruled the nation for 22 years. He initiated programs to build more schools and develop national infrastructure, and people witnessed a change after a long time of political inaction. His government prosecuted and imprisoned critics, some of whom mysteriously wound up dead. In 2006, about one-third of the Gambian population lived below the international poverty line of $1.25 per day. Amidst unemployment and meager civil liberties, thousands of people left the country. Under Jammeh’s rule, Gambia was paralyzed. Fear of expressing his thoughts plagued Dampha who slept with one eye open. Threats of imprisonment have been a fact of life for years. Defamatory comments against the dictator were met with abduction and arrests. The knocks rattled the wooden doors at night, Dampha recalled. Men in ordinary clothes marched in, kidnapped the defamers and vanished into the night, leaving no trace behind. Under the circumstances, it seemed entirely reasonable that people would refrain from questioning the clandestine activities carried out by the badgeless NIA men. Minimal scrutiny meant more leeway for Jammeh to implement his power. While life was difficult for most Gambians, those that Jammeh shunned were openly discriminated against by officials. Dampha belonged to the same village as Jammeh’s opponent Ousainou Darboe, which meant limited access to electricity and deplorable living conditions. In fact, quenching one’s thirst was a predicament that Gambians faced every morning. When Dampha would turn on the faucet, a suspicious flow of water would gush out of the pipes. He would fill his glass and watch it turn a rusty red. Nonetheless, he would gulp it down, knowing there was no other option. Dampha’s decision to come to OU culminated at the same time the country was preparing to let go of the autocrat’s emblematic white garbs and prayer beads. The protests were concentrated in the capital, Banjul, and the largest city, Serekunda. The NIA officers emerged out of the shelter of the night and performed their draconian agendas in broad daylight. Women were raped; men were put behind bars. Resistance had the potential to cost many Gambians their lives. Among those who were directly affected was Dampha. His uncle Darboe, who was an opposition leader, was incarcerated and beaten. Being arrested in Jammeh’s Gambia was equivalent to have received a death sentence, Dampha said. “Most people were never found,” he lamented. Dampha lived in the outskirts of the cities and couldn’t take part in everyday protests. For Samba Bah, a graduate student from Busumbala, Gambia, studying international development studies, not participating in the revolution wasn’t a choice. Bah started as a member of the non-governmental organization Saama Sang Youth and Children Development Association and later went on to serve as a speaker for the National Youth Parliament of The Gambia. As a youth activist, Bah was involved in organizing sit-ins and meetings to advocate for youth-friendly laws and to protest unfair policies installed by Jammeh’s government, the Alliance for Patriotic Reorientation and Construction. Finally, the protests paved the way for an electoral reform. The reform is designed to prohibit electoral manipulation, a tactic that Jammeh frequently used to keep himself in power. As democracy eclipsed Jammeh’s rule, Dampha and his Gambian peers were in search of a way to make their lives and those of others better. The only way he saw out of the debris was through education. Assan Sarr, an assistant professor of history, was visiting Gambia around the same time when he met Dampha and Bah. They planned out their education, and, a few weeks later, both the students were boarding a flight to Columbus. The students realized that a regime change wasn’t enough to transform the state of their country. But the fear of leaving loved ones haunted them. Rather than feeling anxious about his new life, he was afraid of the unknown that he was leaving behind. Fatou Kineh Ndow, a graduate student from Banjul, Gambia, studying mathematics, was always hesitant to talk over the phone. People suspected the government was tapping their phones. Ndow said since the dictator’s exodus, she isn’t scared to call home. 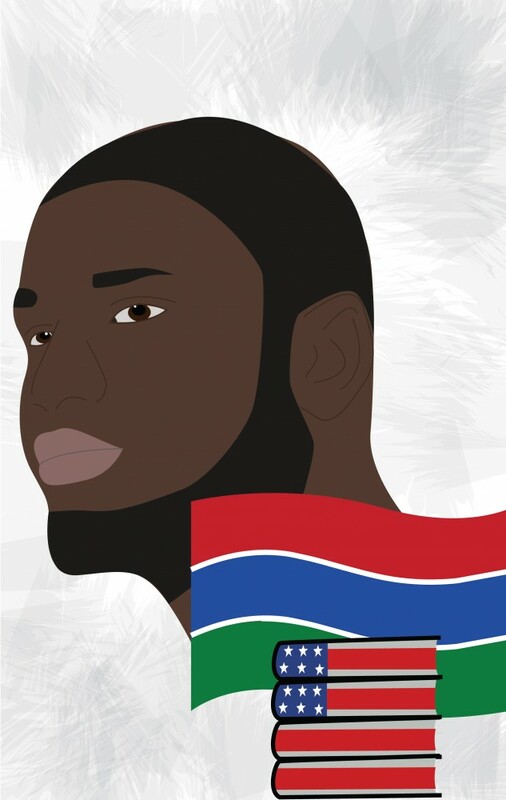 The autocrat’s departure has helped Dampha feel a little more secure about leaving his family in Gambia, and it has helped him enjoy his experience in the states. His daily routine consists of working on his graduate thesis, navigating the aisles of American grocery stores for cereal and drinking clear water that, for once, doesn’t change its shade. Dampha, who didn’t have access to clean water in The Gambia, picks up a bottle of water at the grocery store. Dampha immersed himself in education and finished his two-year graduate program in a year and a half. His academic pace indicates his desire to go back to Gambia and help his community. Under Jammeh, Gambian colleges were heavily mandated by the government. The instruction of any material that did not align with the dictator’s views meant persecution for the teacher. A stunted education system stabbed holes in their understanding of the world. An American education has given Ndow a greater access to many resources she said she didn’t have back home. She considers the convenience of accessing the internet at any time of the day a privilege. Ndow said social science education suffered significantly due to the dictator’s anti-democratic agenda. Dampha believes an American education will help fill those gaps and mend his fabric of knowledge. Since coming to the U.S., the only challenge that Dampha said he has faced — the cold — is a sizable departure from the problems at home. Still, Dampha remembers home with affection. “I know if I now go back to Gambia it will feel like heaven,” Dampha said. He ravenously consumes Gambian media and cherishes the sight of leadership critique. He said two years ago, he could have never imagined a defamatory tweet or a Facebook post about the Gambian government without consequences following suit. In these civilian objections, he sees a new Gambia, one where democracy is fundamental to the society. Now, Dampha wakes up every morning rested. While slipping into his plaid jacket to fight the midwestern winter, a smiling Dampha is grateful above all for “one key thing” in America. “Being able to walk on the street without having to look over my shoulders,” Dampha said.